Wigan Wallgate is quite a small station for a town the size of Wigan with two platforms on an island and a third bay platform at its north end. It's so foggy that when I take a photo of a train on the station, it is more fog than train! The train I get has come from Rochdale via Manchester Victoria and is half full. Soon after we leave, we go under the West Coast Main line, though you can hardly see it in the fog. We then pass some sidings and a signal box on the right and the line to Southport leaves ours, also on the right. We are on an embankment and pass over the Liverpool to Leeds canal and see Wigan Athletic FC and lots of retail outlet shops on the right. We pass industrial units on the left and warehouses and then a park on the right. We go into a low cutting and see new houses on the right before stopping at Pemberton. 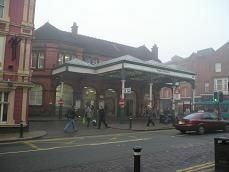 It has two green-framed metal shelters on its two platforms. About twenty people get off and the train is now only a quarter full. We are in a cutting again and on the right are lots of pieces of track laying flat against the embankment. Perhaps this is the old track that has recently been lifted to make way for the new welded rail? We're still only doing about 40 mph as we stay in the cutting and then slow for Orrell. It too has two green-framed metal shelters and the original footbridge. We go into another cutting and pass more new houses on the right and then enter a tunnel, before emerging at Upholland station. This time it has two maroon framed glass shelters on both platforms. As we leave, there is more track lying on the side of the embankment. We now see a bit of countryside at last, though we briefly pass some small industrial units on the right. We go into a low cutting again and slow to about 10 mph, passing a semaphore signal and then we stop at Rainford station. It has two blue-framed shelters and its original footbridge. Interestingly the station has Mersey rail on its station signs. There is a pub called the Junction next to the station, as this was originally the junction for a line to Southport. There is still a signal box here and the driver has to pick up the token as the line now becomes single track. There are ploughed fields on both sides to be seen as it begins to get dark in the fog now. We are on an embankment again as we speed up to about 60 mph. We pass what looks like a coal spoil heap on the right and woods on the left. In the distance you can see several streetlights, indicating that we are approaching Kirkby, a new town, built in the 1960's and 70's, for overspill housing from Liverpool. We pass lots of houses on both sides, before entering a cutting and coming to stop at the buffers of Kirkby station. We walk along the platform, past another set of buffers and you are on the Mersey rail part of the station. There is a new station building at the top of the embankment. Summary: A busy enough line, which sadly has been cut in two at Kirkby, stopping the possibility of through trains from Liverpool to Wigan Wallgate, just like it has at Ormskirk.